The Lunar New Year film MISSBEHAVIOR (GUNG HEI BAK POR) asked Patrick Tse Yin to guest star. Indeed wherever Sei Gor was beauties would be there. 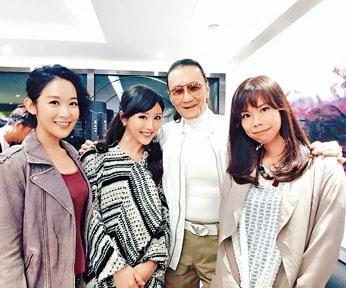 Director Pang Ho Cheung thoughtfully arranged for five great beauties Isabella Leong Lok Sze, DaDa Chan Jing, Isabel Chan Yat Ning, June Lam Siu Ha, Ashina Kwok Yik Sum to be around him, as all five would have a chance to work with Sei Gor. Would Sei Gor pick on the new comers? "I already haven't worked on anything for two to three years, the world has changed. It's more like they are picking on me. Now I have to learn from new comers instead. The director and they all say that they have a lot of fun. I hope to have a chance to work together again." How did working with Pang Ho Cheung and the team feel? Sei Gor said, "They are my junior colleagues, I don't dare to criticize them. I follow their orders completely." Leong Lok Sze's scenes have already been done. That day her sisters in the film Chan Jing, Chan Yat Ning and Lam Siu Ha said that they would miss her and posed for photos to bid farewell. Isabella said, "I really don't want it to end so soon. Thank you Director Pang Ho Cheung for giving me a chance to participate in such a happy Lunar New Year film, the most important in the Lunar New Year is for everyone to have fun from watching it!"